INTRODUCTION Minimally invasive surgery has allowed less abdominal wall trauma, but anastomoses are completed in a fashion similar to open surgery with staplers. Disadvantages to stapled anastomoses include requiring large port sites and large enterotomies for passage of staplers. An alternative is a compression anastomosis created by applying a constant pressure between adjacent bowel limbs resulting in pressure necrosis and fistula formation. Until now, this technique has been limited by the delay in the formation of the anastomosis and lack of immediate drainage. 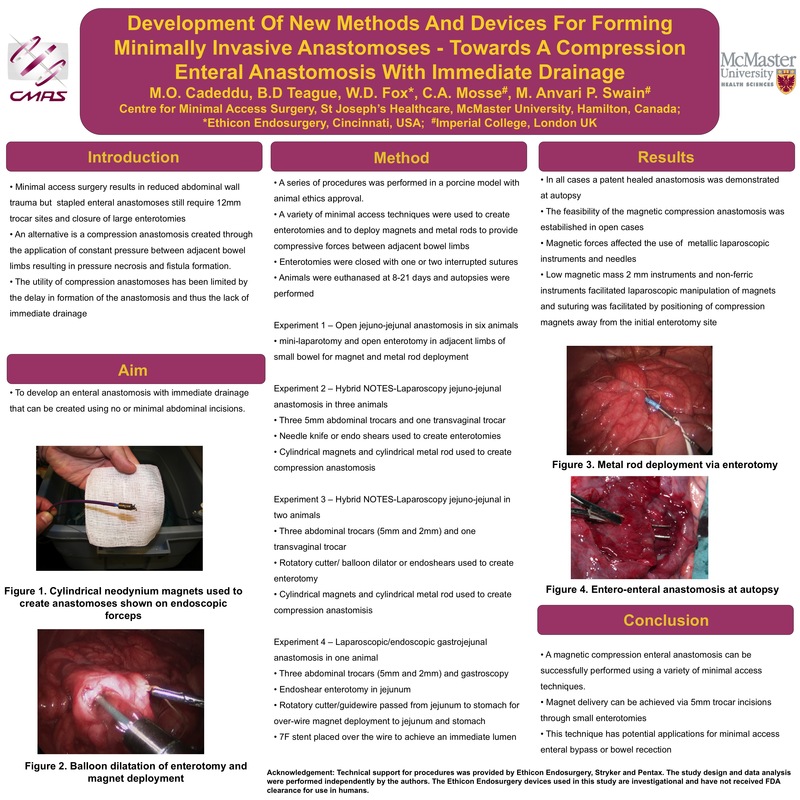 The aim of this study was to develop an enteral anastomosis with immediate drainage that can be created using no or minimal abdominal incisions. METHODS AND PROCEDURES A series of experimental anastomoses were created in a swine model (with animal ethics approval) using magnetic compression forces. Various magnet designs, configurations and delivery systems were trialled in 12 survival animals. A variety of surgical instruments including low magnetic mass 2mm instruments and 5mm non-ferric instruments were used. Prototype devices were also developed for endoscopic magnet delivery and anastomosis formation. RESULTS Initial open surgical experiments demonstrated that magnetic compression forces can be used to safely anastomose small bowel loops. Laparoscopic, NOTES and endoscopic techniques were developed to deliver the magnets to small bowel and stomach and successful entero-enteral and gastrojejunal anastomoses were created using a variety of delivery techniques including laparoscopy, needlescopy, NOTES and endoscopy. Refinements in technique allowed difficulties such as manipulation of the magnets and large enterotomy to be overcome. Finally a technique for compression enteral anastomosis with immediate drainage was developed using the information gained from earlier experiments. CONCLUSION A magnetic enteral anastomosis with immediate drainage can be successfully created using a variety of minimal access techniques. The reduced diameter of the magnets and delivery devices used has advantages for minimal access surgery compared to currently available stapling devices. This technique has potential applications for minimal access enteral bypass or bowel resection.